Dubai: The UAE has condemned Iran’s interference in the Middle East, accusing Iran of creating more tension and instability in the region and posing a serious threat to the stability of the Middle East. He called on the international community and the Security Council to seriously pressure Iran to end its interference and support for terrorist and sectarian militias in Arab countries. 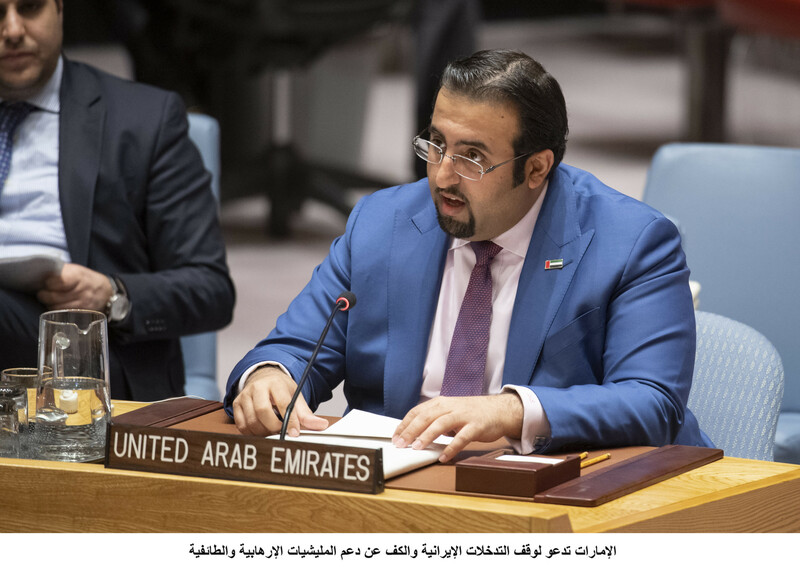 On Yemen, Al Shamsi reaffirmed the UAE’s commitment to supporting the work of Martin Griffiths, Special Envoy of the Secretary-General on Yemen, and the UN-sponsored political process for a lasting and sustainable political settlement. While the Saudi-led coalition remains committed to the Sweden Agreement on Hodeida and relevant Security Council resolutions, Iranian-backed Al Houthis have repeatedly violated both, he said. Al Shamsi called on the UN Security Council to take firm and decisive action against Al Houthis. On Syria, he noted that Iran is obstructing any possibility for a political solution there, adding that an Arab regional solution was pivotal to resolving the conflict. On Palestine, Al Shamsi reiterated the UAE’s commitment to the Palestinian cause and called on Israel to stop its illegal practices against the Palestinian people, which undermine the two-state solution. He underscored the UAE’s historic and continued support for the UN Relief and Works Agency for Palestine Refugees in the Near East (UNRWA) and its humanitarian work. Between 2017-2018, the UAE provided upwards of US$173 million to support UNRWA. On Libya, Al Shamsi welcomed the progress achieved through the implementation of the UN Action Plan, which represents a viable framework for resolving the political crisis. However, he expressed concern for the growing threat posed by terrorist groups in Libya and emphasised the vital need for international efforts to restore security and stability in Libya. “The international community, especially the Security Council, must address those parties that continue to undermine regional stability and peaceful coexistence so that the region can invest its energies and resources in building peaceful, prosperous, and tolerant societies free from conflict, violence, and terrorism,” he said.